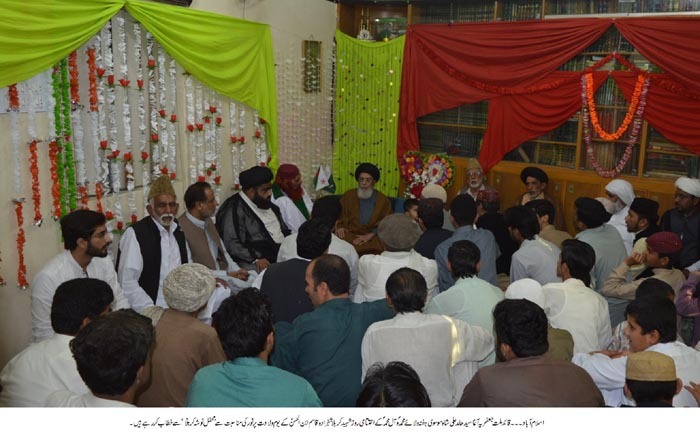 ISLAMABAD, April 14: Supreme leader of Shia Ulma board and TNFJ Agha Syed Hamid Ali shah Moosavi said that a crack has been produced between Pak Iran Friendship with Chankyai politics. Aid from Pakistani Govt for Iran Flood victims is highly appreciable all Muslim world should follow this Pakistani act, Muslim countries should keep in mind those evil powers who have bound Iran in multiple restrictions particularly on Iranian’s defense institutes they will not spare rest of Muslim countries including Pakistan and Saudi Arabia so Muslim world should be visionary. Prime Minister Imran Khan should announce to finalize Pak Iran gas pipe line project in his coming visit of Iran. India is utilizing Muslim world’s reserves and resources if India has liberty of economic relationship with Iran then Why Pakistan is hesitant for the same even being a Muslim one? Rulers should act courageously. Karbala is the eternal movement of Islam’s protection whose heroes have blessed Islam with eternal life, Aaqae Moosavi described these lines on the event of “Mehfil e Nausha e Karbala” in connection of birth celebrations of Shahzada e Qasim ibn ul Hassan a.s on last day of “Hafta e Wilaye Muhammad O Aal e Muhammad saw.